Click Here to View Complete Manual on Wet Wash Procedures! Safety Wash is a mild neutral PH water based exterior wash and wax concentrate designed to be gentle on your aircraft. Safety Wash provides detergency and built-in easy rinse characteristics that will enhance gloss and eliminate the risk of streaking. Formulated for general routine washing of aircraft and automobiles. Safety Wash is not designed to clean heavily soiled areas. Works great on both Planes & Automobiles! 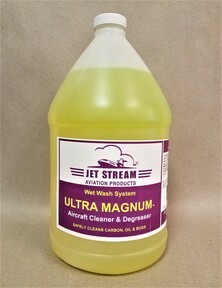 Ultra-Magnum is a non corrosive heavy duty alkaline cleaner with built in buffers for additional safety. Formulated to rapidly dissolve carbon, bugs, and oil from the exteriors of aircraft. Has been designed with built in rinsing agents when wet washing. If dry washing an aircraft just spray on and wipe clean, no rinse necessary! HydraSolve is a thickened, heavy duty, water soluble gel degreaser formulated for efficiency and performance in a broad range of cleaning and degreasing applications. 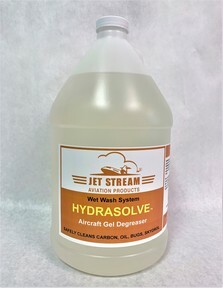 Hydrasolve will easily and safely remove carbon exhaust, exhaust tracks, soot from thrust reversers, oil and bugs. Hydrasolve clings to the surface being cleaned and has the ability to rinse spot free. 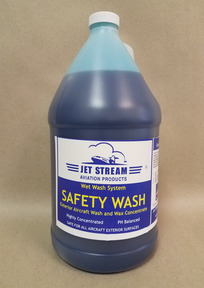 The Stream Wet Washing Kit comes complete with 1- 5 gallon pail of Safety Wash, 1- 5 gallon pail of Ultra–Magnum, 1 aluminum telescopic wash pole, 1 wash brush, 1 neoprene aircraft squeegee, 1 gear parts brush and 4 quart bottles with trigger sprayers. This kit contains everything needed to completely wet wash any size corporate aircraft. Nylon Aircraft Wash Brush Large 14” size will speed up the wet washing process by eliminating brush strokes. 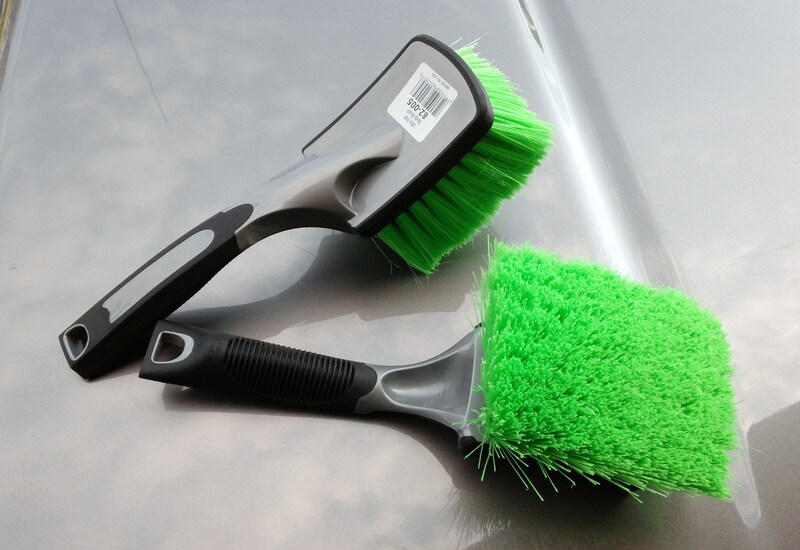 The green flagged nylon bristles and foam block backing are completely safe for aircraft surfaces. The foam block has two threaded handle holes. Use with TP12 Pole. This 12 Foot Telescopic Pole is without a doubt the best pole available for wet washing and drying an aircraft. This aluminum pole is lightweight yet strong and easily maneuvers through your hands “because of the interlocking mechanism”. Has interlocking system which is reliable and easily adjust from 4’ to 12’ as needed. These poles are so reliable it will probably be the last set of poles your flight department will buy. We recommend using this pole with our wash brush, aircraft squeegee and floor squeegee. Super Safe Plastic Squeegee Backing, Will Not Scratch Aircraft. Our Neoprene Aircraft Squeegee has been improved, it is now constructed from white plastic instead of metal. 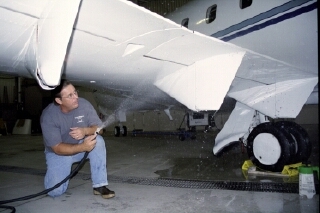 Will remove water from un-even aircraft surfaces safely and smoothly. It will save time and dozens of wet towels while completely drying any size aircraft in just minutes. High quality plastic chemical resistant trigger sprayer and bottle. Dilution ratio markings from 10-1 to 1-1. Sprayer will adjust from a stream to a mist. 9-3/4 by 1-3/8” Dia. 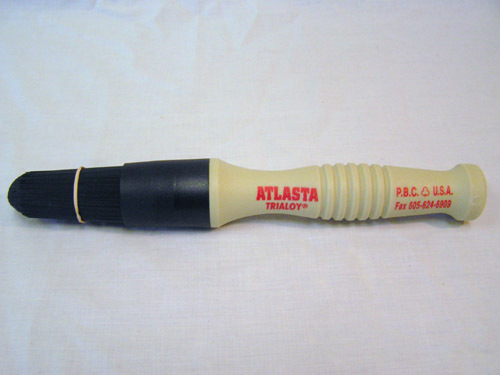 Poly handle with solvent resistant, stiff nylon bristles for tough, hard to reach areas when detailing aircraft gear assembly. This soft bristle brush is ideal for cleaning brake dust, oil, bugs, and whatever comes off the runway from your wheels and gear assembly. Long wearing and safe on all painted surfaces.